Caterpillar’s D Series skid steer loaders is demonstrated at a press briefing. Photo: Darren Constantino. 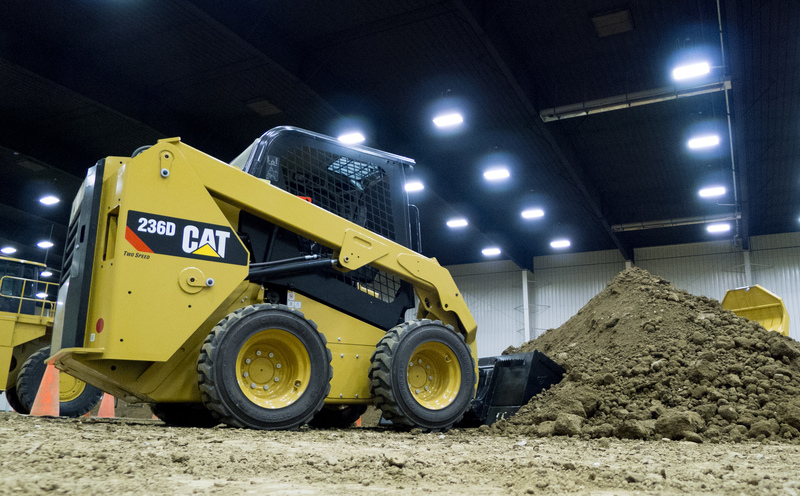 Caterpillar introduced a number of new products, including its D Series skid-steer loaders, at a press briefing at its Edwards, Ill.-based training and demonstration center. In addition to equipment overviews from the company’s product application specialists, the event included equipment demonstrations, product walk-arounds and an optional tour of Tower Rock Stone Co. in Ste. Genevieve, Mo. 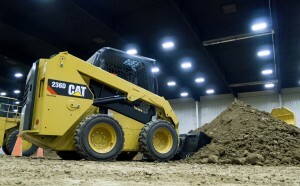 Fuel efficiency was a common theme throughout the product introductions, and Cat also showed off its 988K wheel loader, which was introduced earlier this year at the Bauma trade show in Munich, Germany. Caterpillar rolled out four new D Series skid-steer loaders and updated two current D Series machines to create the new D Series line. They feature a completely redesigned cab, new lift arm design for improved sight lines and increased engine performance. The four newest D Series models are replacements for the B3, C and C2 Series predecessors. The D Series line now encompasses six skid-steer loader models ranging in rated operating capacity from 1,800 lb. (816 kg) to 3,700 lb. (1,678 kg). The 236D and 242D are mid-size frame models and can be as narrow as 60 in. (1,524 mm). To provide broader selection for skid steer buyers, the 236D has been redesigned to a smaller platform size. The result is a power-dense radial-lift-path model that offers compact dimensions. Specs include: 1,800-lb. (816-kg) operating capacity, 123-in. (3,122-mm) hinge-pin height, 74.3 hp (55.4 kW) gross engine power and peak torque of 195 lb.-ft. The new D Series large frame models are the 246D and 262D, with rated operating capacities of 2,150 lb. (975 kg) and 2,700 lb. (1 225 kg), respectively. The 236D, 242D, 246D and 262D feature an electronically controlled 3.3-liter engine that meets Tier 4 Final (Stage IIIB) emissions standards. The Cat C3.3B engine provides 74 hp (55 kW) with 8 percent more torque and a 6 percent increase in fuel economy compared to the previous models. The largest D Series models, the 272D and 272D XHP, were launched in early 2012 and continue to be powered by an electronically controlled 3.8-liter engine, which meets Tier 4 Interim (Stage IIIB) emissions standards. The Cat C3.8 produces 98 gross horsepower (73 kW) for the 272D and 110 net horsepower (82 kW) for the 272D XHP, which powers an auxiliary hydraulic system producing up to 40 gpm (150L/min.) of flow at 4,061 psi to handle the most demanding powered work tools. The 272D and 272D XHP also receive the new cab environment and features, as well as the new lift arm design.